As many of you are aware, we recently launched a new theme called ‘White’ for Ganttic’s planner. Since then, we have been collecting feedback and working hard to make its UI more user-friendly. Generally similar to the previous version, we are maintaining the focus on the UI's minimalistic feel so that all your plans can stand out in the sea of white and grey. We are making it easier to differentiate the planner's sections by implementing background colours. The timeline date range selection will be enlarged for a clearer overview. You might also notice the new and improved arrows when you hover over the timeline. The function to add a project, a report or a view will migrate into the ‘NEW’ button as seen in the screenshot above. 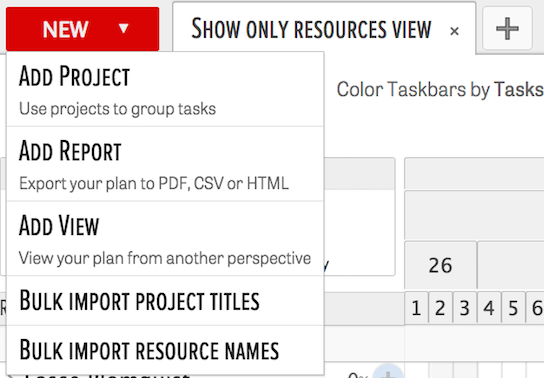 When you open a new tab in the planner by clicking on the plus sign on the top right of the picture above, it will only list existing projects, reports and views. 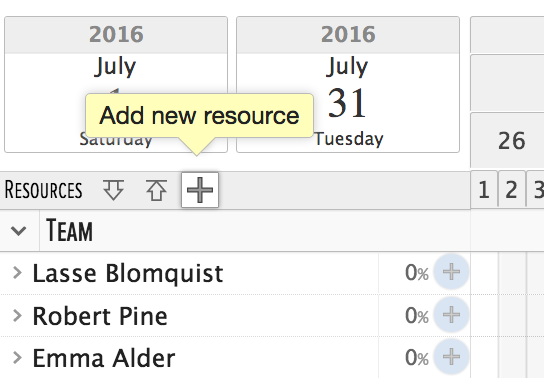 To add a new resource, there will be a plus icon along the Resources column where you can manually create one resource at a time. You will not be able to add just one resource from the ‘NEW’ button. 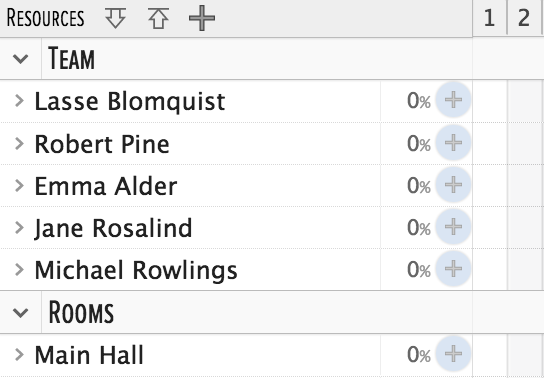 To bulk import resources, click on the ‘NEW’ button and select ‘Bulk Import Resource Names’. To create a task, there will be a plus icon beside every resource where you can create tasks manually. You will not be able to add a task from the ‘NEW’ button. Another way of adding task is to simply click-drag-release on the Gantt area. Tip: You can use this plus icon to assign multiple resources to a task. This concludes the tomorrow’s update for the White theme. A big thank you to all who provided valuable feedback on the previous version! As always, we are open to listening to your thoughts for this version of the White theme. Please direct all feedback to support@ganttic.com. If you don’t have an account and would like to try out the White theme, sign up for Ganttic to enjoy a free account with unlimited users, tasks, reports and more. p/s: The Blue theme remains as it has been and all developments have been halted for the Blue theme.